Vosges is another of those chocolate brands that I find I have been inexplicably avoiding. If there was a reason for why I've been ignoring Vosges, I have long since forgotten what it was: it's been years since I had any of their chocolate. Even now that I return my attention to them because their chocolate is fair trade and even as I quickly got excited about a chocolate with vanilla and cherries, I felt myself hesitating. Over what, I don't know. Sometimes Vosges focuses more on flavored chocolate than I like to do, but this was a flavor I wanted to try. Could it be the packaging? I want to say that the card box looks nice, yet there seems to be something that I don't like that I can't quite put my finger on. Are there too many font colors (red, purple, and white)? Is there too much of a contrast between the frilly logo and the more modern approach of a white background paired with photographs of the various ingredients? I don't know. The silver wrapper features purple frills to match the Vosges logo, and the chocolate bar has four squares with said logo and four with a woman holding a Vosges bag--she makes me think of founder Katrina Markoff. It's a pretty design, reminiscent of shopping malls and preppy resorts. While not necessarily the usual look for chocolate, it works. As I alluded to, this particular bar is the Vanilla Rooibos Tea, which contains both rooibos and dried tart cherries. The chocolate is 45% dark milk, which sounds great and is exactly the type of chocolate I need lately. Such a chocolate, in theory, would pair well with both the sweeter nature of the vanilla flavor and the tartness of the cherries. 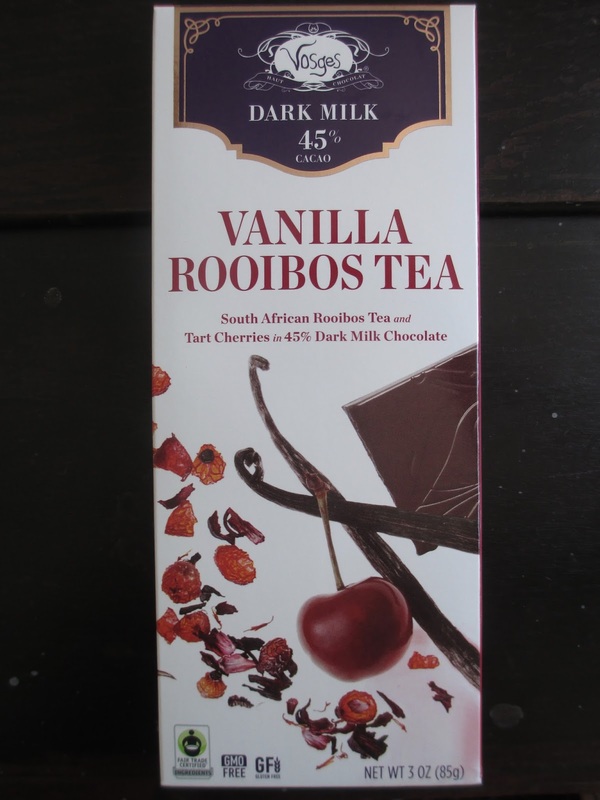 While I like cherries in chocolate and I do like tea, I am not overly fond of rooibos. In tea, I usually only like it when there are plenty of other flavors with it. But the thing is, the labeling describes the rooibos as having the vanilla flavor; when I saw the name, I thought it meant vanilla and rooibos. I believe there is vanilla in the chocolate (it's the most likely candidate for what's called "natural flavor"). But apparently any vanilla flavor comes from the rooibos, which I honestly wouldn't have realized on my own. The vanilla flavor came and went, and I did at first attribute it to vanilla rather than to rooibos. What I had thought of as the taste of rooibos I only noticed in passing once or twice, which I was fine with, I might add. The cherries have more flavor, though. They may be tart but they're not sour, and they taste just right in this level of chocolate. Speaking of chocolate, the chocolate doesn't have the strongest flavor itself. It just gives a basic milk chocolate flavor, not super sweet (so you can tell that it's up there are 45% cocoa) and also not very dark or full of depth (I might have expected just a tad more). It's a base for the flavors, not a star on its own (because it isn't, after all, on its own). I do find that I enjoy eating this chocolate. Wherever the vanilla flavor comes from, it goes well with the chocolate and the cherries, which already make for a good pairing. So I'm going to categorize this chocolate bas as an alternative to candy bars. Better quality in all senses of the word but still more of a casual type of chocolate. This is one of those bars, as is pretty common for Vosges from what I remember about them, that is more about the flavors than about the chocolate itself, as you'd expect from looking at the labeling. Dessert chocolate, snacking chocolate, gifting chocolate, all that sort of thing. In fact, I think this one would do well packaged into individually-wrapped squares. As with TCHO, whatever has kept me from this company in the past, I'm quite enjoying this present moment. I guess the thing about flavored chocolate is that usually we all have our preferences. I know now, for instance, that I'm probably not going to like a chile chocolate much because I just don't usually care for chile chocolate. Or bacon, yuck. Salt, maybe. Caramel, yes. And cherries yes. So in the future, rather than going out of my way to try various flavors, I'm going to try and stick more to what flavors I know I can be a fair judge of. That approach has served me well with this Vanilla Rooibos Tea.